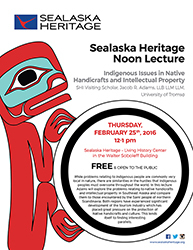 Sealaska Heritage Institute (SHI) will sponsor a lecture by a visiting scholar from Norway who is researching indigenous intellectual property rights. In his talk, Indigenous Issues in Native Handicrafts and Intellectual Property, Jacob Adams—a Ph.D. student in law who serves on the law faculty at the University of Tromsø in Norway—will introduce his work in the area of indigenous intellectual property rights. Through his research, Adams, who is also a practicing attorney with law degrees from universities in Australia and the United States, is examining alternative means to protect indigenous intellectual property using trademark law, with a focus on Northwest Coast culture and art. The institute is particularly interested in Adams’ research, as the protection of ownership of Tlingit clan property or at.óowu—including crests, names, songs, stories—has been an ongoing, major concern for years, said SHI President Rosita Worl. “More often we have been told that our clan crests have been in the public domain for decades and that ownership protections do not exist," Worl said. Adams has been in the institute’s Visiting Scholar Program since January and will conduct research at Sealaska Heritage through April 2016. He will give a second lecture on his preliminary findings upon completion of his field research. The lecture is scheduled from noon-1pm, Thursday, Feb. 25, in the Living History Center at the Walter Soboleff Building in Juneau.